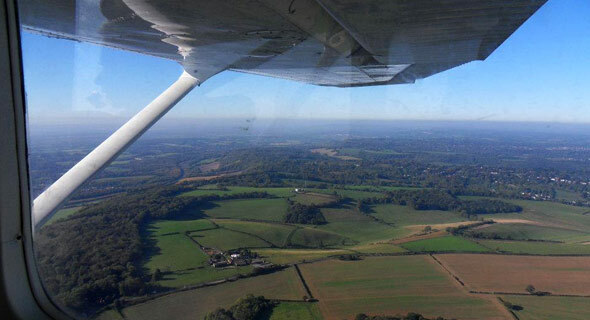 Trial lessons are of one hour duration with a qualified instructor and the recipient will spend most of this time at the controls of the aircraft. The flight will be from Biggin Hill and will return to Biggin Hill. If the recipient subsequently decides to work towards qualifying for the Private Pilot’s Licence, this first lesson counts towards the flying hours required and can be entered in their Pilot’s log book. Trial Flights are limited to persons over the age of 14 years – and are subject to weight & height limitations however don't let this put you off as most pilots can be accommodated. To be clear, basically we can accommodate anyone who weighs less than 20 Stone (280 lbs) and is less than 6' 5" tall. Vouchers are valid at the price sold for a period of three months. Thereafter the club reserves the right to make a surcharge if our costs, notably that of fuel, increase significantly. It is not necessary to book the date and time of the trial lesson when purchasing a voucher but don't leave it too long as the voucher is only valid for 1 year from date of issue. If you book a trial lesson using PayPal we will be in touch shortly after by email to confirm your booking and discuss a suitable date/time for the flight. If you wish we can contact you by telephone but you will need to type your number, and any other relevant information, into the 'Add Special Instructions for the Merchant' link as PayPal's security policy prevent them from disclosing your number to us. Alternatively, trial lessons can be given without buying vouchers. Bookings can be taken and the costs paid on the day, cash only please. For trial lessons paid for without vouchers, please contact Russell Dennis as above. You can book a trial flight in our aircraft below, please make sure you fill in the Student's name in the box provided before clicking on the 'Checkout' button. Don't worry if you are paying for this flight as a present, we will contact you about the flight and not the student you name. Please enter student name(s) in the box below.